Running wires over long distances or over areas that are concrete or asphalt can cost thousands of dollars and may require time-delaying digging permits. And then the wiring eventually goes bad or is accidentally cut and you have to do it all over again. A cheaper and faster solution is to install a MURS Callbox. 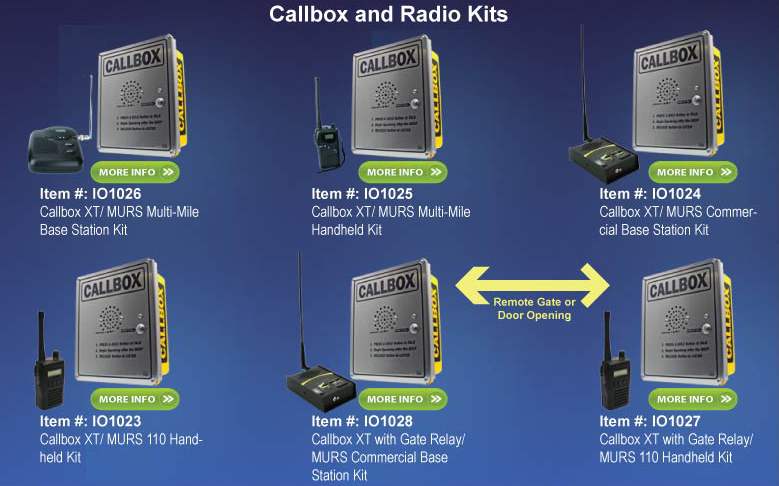 The MURS XT Callbox works with our other MURS radios and it provides long range, 2-way voice communication from the fixed location of the Callbox to any of your other MURS intercom units. It has a range of up to one mile or more with an optional external antenna. This heavy duty outdoor intercom is designed for construction sites, golf courses, hotels/motels, airport parking lots, gated entrances, manufacturing, college campuses, hospitals, receiving docks, amusement parks, resorts, locked entrances, farms, ranches, warehouses, campgrounds, parking lots, delivery doors, and any other application that needs two way communication for safety or convenience. There is no need for extensive wiring, trenching, remodeling, or installing dedicated phone lines with expensive monthly fees since the MURS Callbox is completely wireless. This callbox can operate on 6 D-cell batteries (alkaline or Ni-Cad rechargeable). However, it comes programmed with the battery-saving Auto Turnoff feature disabled so we recommend using an external power source. This way your callbox will be available to receive calls and the gate opening command at any time instead of just when someone presses its call button. The MURS Callbox has two modes of power consumption. In Automatic Turn-Off the unit turns itself off after a programmed amount of inactivity (up to 4 minutes). It can only be turned on again by pressing its Call button on the Callbox. In this mode it cannot receive calls from other intercom or handheld radio units. It can only make calls and then other units can respond.This is what the unit is programmed for and we recommend buying the optional power supply so you can open the gate even if no one presses the Call button. In Normal mode, the unit does not turn itself off and the MURS Callbox can not only make calls, but receive them as well. This mode consumes the largest amount of power and should only be considered if an external source of power is available. If an external source of power is used, the internal batteries can be installed as a back-up against loss of power. If you use the MURS Callbox Outdoor Intercom along with the MURS Commercial Intercom , or the MURS J-V110 Two-Way Radio (see pictures), the Callbox can be used to remotely control gates, magnetic door locks and other devices. The MURS Callbox has a single 1-Amp switch output that can be activated when the Callbox receives a unique 2-Tone encode signal that the MURS Commercial Intercom and MURS J-V110 can send. A 2-Tone encode signal can also be used to activate the Listen-In feature of this Callbox, which lets you listen to what's happening around the Callbox for up to 30 seconds. On/Off Code: The switch will close when a preprogrammed code is received, and open when it is received again. The switch will also open by itself when the Callbox's preprogrammed Automatic Turn Off feature is activated. Switch On When Called: The switch closes when the callbox first receives the call and it remains on until its Talk button is pressed, or a programmable timer expires (1-255 seconds). Switch On When Callbox In Use: The switch will close when the Callbox first sends or receives a call and remains closed until a preprogrammed timer expires. Switch On When Active Includes Turn-Off Code: Switch closes when the Callbox sends or receives a call with the added ability to open the switch when the Callbox receives a preprogrammed code. Momentary Close: Switch will close for 1-255 seconds when a preprogrammed code is received. Alternate Open and Close: Switch will toggle between open and closed when it receives a preprogrammed code. The Callbox transmits a single beep when open and a double beep when closed. The MURS Callbox with Gate Relay also has a Sensor Input that allows it to also operate as a motion, gate entry, tamper or vehicle detection device. It will send a tone alert when optional switch/sensor status changes. The Callbox will send a warning tone when a change in the Sensor Input is detected. The Sensor Input will respond to an OPEN or CLOSED switch. The Listen In feature allows remote activation of the callbox's transmitter when a unique 2-Tone code is received. This enables you to listen in to the area around the callbox for a period of up to 30 seconds. The MURS Callbox is housed in a fiberglass enclosure with a stainless steel faceplate that includes tamper-resistant fasteners and a concealed antenna making it perfect to withstand harsh elements. Since this callbox operates in the MURS frequencies, no FCC license is required. For more details see our Wireless Call Box System Facts article. This unit comes preprogrammed to MURS Channel 1 with an Interference Eliminator code of 01 which matches our other MURS Radios. Unless you need other features activated, you should not have to program this unit, but it is field programmable. "We are utilizing the call boxes at three vehicle entry gates onto the property. Two of the locations are equipped with badge readers that operate the gate. One of the locations is a Visitors entrance where the person entering interacts with our Security via the call box. Our old system was done with all underground wiring and we were experiencing many problems with broken underground conduit. The wireless solution was the way to go for us. The system was very easy to install especially with the additional functionality that I wanted. The technical customer support was excellent. They seemed to care a great deal about my project being successful which left me with the confidence of knowing that If I ran into any problems that all I needed to do was pick up the phone. We have not experienced any problems with our system." "We use the callbox to talk to visitors and open the entrance gate from the office and portable radios (walkie-talkies). We can talk to visitors wirelessly and open the gate wirelessly from the office or the portable radios. Personnel can be anywhere on our 40-acre site and still communicate with the gate and open it. Physical installation was simple and the instructions are good. Technical support is very good. The programming is a little tricky until you understand how to do it." "We use your callbox on the outside door of our plant so truck drivers can call in and identify themselves and we can then let them in remotely through a security door. Everything about the callbox works for our application, but we especially like the how we can use a wireless handheld unit to remotely manage the entrance when we have to leave the office to go to other parts of the plant." For internal relay use, confirm that your application will NOT exceed the maximum rating of the on-board relay of 120 VAC @ 1 amp. Batteries good for one year or up to 7,000 transmissions when used in Automatic Turn-Off mode.